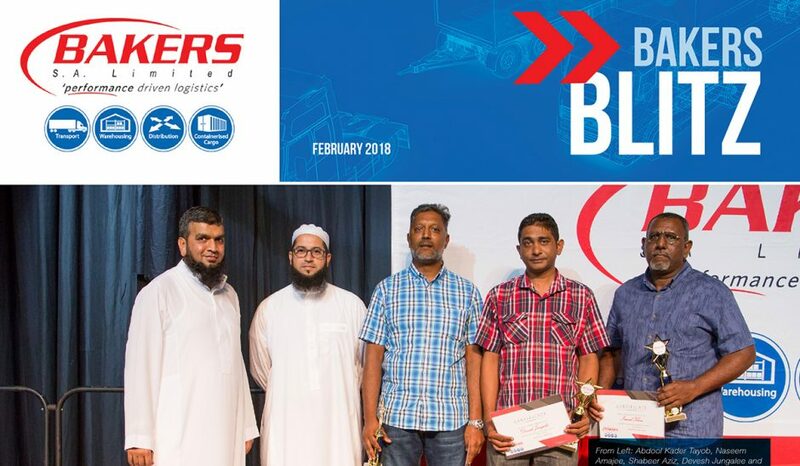 The Bakers S.A. Limited Banquet Dinner and Annual Awards ceremonies has become a highlight of the company’s calendar, and the latest edition – held on the 13th of January and the 20th of January 2018 in Pietermaritzburg and Durban respectively – did not disappoint. The ceremonies are aimed at honouring top performers for the year, recognising the outstanding efforts of Bakers’ management and employees, and thanking suppliers for their contribution to the success of the company. The Durban event was an elegant affair hosted at the Durban Exhibition Centre (DEC). In attendance were Bakers’ Executives, senior management, suppliers, clients, and partners. Mr. Morena Sithole, Managing Director at Masana Petroleum Solutions, was the Guest of Honour and Keynote Speaker. Guests were treated to his insights, stemming from almost 20 years of experience in the industry. Other highlights of the programme included an address and video presentation by Chief Executive, Abdool Tayob, detailing challenges, opportunities, and achievements of the company and inspiring guests and employees to work toward common goals and visions in the year ahead. The ceremony – expertly managed by Programme Director, Ravi R – was capped off with a sumptuous meal and the awards for outstanding achievements by employees. bring together all members of the Bakers family to express gratitude for making Bakers the company that it is today. Bakers S.A. Limited would like to take the opportunity to once again, congratulate all the recipients of awards and warmly thank all the attendees of the events.